Not in my kitchen Mary! Mary Berry, God love her, is the latest cook to have a recipe banned from my kitchen. The recipe in question is Two Tone Toffee Chews, or as we call them Two Tone Toffee Chew Chews. Young Grumbling Tummy decided that she fancied a little bit of baking with mummy. Being a mummy who loves to eat cake but who tries desperately not to eat cake I agreed cautiously. She eagerly started flicking through my Mary Berry recipe books. “This one” she said grinning and pointing at what seemed like a very simple tray-bake. It was the sort of recipe that mini GT could pretty much handle herself with a bit of supervision which sounds pretty perfect. Everybody happy! I will add the recipe at the end but it really is terribly simple – like mars bar crispy cake with butter toffees and coco pops added in. It is the butter toffee incidentally which I believe has caused the distress! Mini GT stirring whilst eating a toffee. Grumbling Tummy HQ a bit messy with many bottles of wine kicking about – ho hum! As I thought, the little light of my life thoroughly enjoyed making this tray-bake whilst I simply flounced around the kitchen giving direction and encouragement and feeling vaguely smug. I was also surprised that my little food hater actually ate quite a lot of this effort – well 5 of the 24 squares over 24 hours. B also thought it was lovely and had A few squares with a cup of tea. That leaves 16 squares of Two Tone Toffee Chew Chew left. I pondered taking them to school or to the childminders but sadly by the time the next morning rolled around there was a problem. “Where have all the Chew Chew’s gone mummy?” wailed my daughter as she stared into the almost empty box! Her hands grasped at the two little squares sadly rattling around. I was speechless! How to explain that mummy just could not keep her paws off of these delectable little toffee squares and spend a whole day and evening making trips to the kitchen. How is is possible that I ate 14 toffee bloody chew chews! Even my husband who is well aware of my lack of control around sugar was rather surprised. So sad to say Mary that your Two Tone Toffee Squares join the likes of Nigella’s Rocky Road and any sort of chocolate truffle recipe at all in growing list of banned recipes. I simply lack the control to cope! For those of you who do not have a problem with the sweet stuff here is the recipe. Line a traybake tin with greaseproof paper (I don’t have one of these so used one of my cooking ceramic dishes). melt. The toffees will melt last and it takes about 10 to 15 minutes for it to be properly melted. in and press with the back of a spoon. I have been a very lazy blogger, partly due to that thing called life getting in the way and partly because I have been treading that tight rope of balance with food for a while. I have sort of been waiting to be slim and happy and ready to divulge my wonderful foodie finds, but sod it. Here goes. Part personal journey, part observation and all moan. Here’s to all the food lovers who like me find it all a bit of a struggle sometimes. I adore food, far too much, and my love of food has made me somewhat greedy. There is no real way to sugar coat it. I am a finish a packet of biscuits once started sort of gal, a stranger to moderation you might say. I do try ….. god knows I do but I also seem to have a lack of that little thing called will-power. All in all it is a recipe for disaster. I regularly fling myself head first into a few days of wine, cheese and sticky toffee pudding with a big happy smile on my face and then spend the next few weeks (if not months) marvelling at how such a teeny tiny eeny meeny little slip could possibly result in 6lbs on my behind! Unfortunately the heady days of losing your weekend weight in a day or two are long gone. Apparently middle-aged women (awful term) are tremendously good at retaining fat. How terribly clever of us! So I found myself at the start of the year struggling to squish into my jeans and wondering which diet to go onto next. 5:2, sugar-free, Atkins, Weight Watchers, Dukan, Slimming World, Scottish Slimmers, clean eating – the list is endless and NONE of them really work long term. I have tried most of them. People who say “this diet does work, I have lost weight on it 10 times, its brilliant” are actually telling me that really it doesn’t work because they have had to go back to it 10 blooming times. Wake up people! Even worse than diets are “lifestyle plans”. These are basically diets that pretend not to be which is just darned sneaky if you want my opinion. They are actually more irritating than regular diets and say things like “cleanse your cupboards of all temptation” Who the hell are these people. I would like to see the look of Mini and B’s faces if I stripped the house of crunchies and haribos. Just eat healthily my rather sickeningly slim chums chime. Oh really!! I am a bright cookie and believe it or not I actually know what I should and shouldn’t eat. I just …….. don’t. My main meals are more often than not terrific, however my snacking leaves a lot to be desired. I once used the popular app My Fitness Pal and day after day it showed on its cute little pie chart that around 50% of my daily calories came from snacks …… and possibly prosecco. But why oh why is this the case. Why does person A feel happy with one chocolate digestive with a cup of tea whilst person B will eat half the packet, attempt to hide it from herself and then finally give in and eat the rest really very quickly whilst standing in the middle of the kitchen, guilt kicking in before the last biscuit is munched. I thought upping my exercise might be the answer but I soon learned that running 5K three times a week may be great for me but that I can’t out run a bad diet. Ooft that was a very hard lesson. I did spend a few blissful weeks truly believing that a Chinese takeaway, three glasses of red wine and a crunchie would be balanced out by a run. The good news is that I am still running but it is not half as much fun knowing that I can’t eat a chocolate brownie and whipped cream with impunity. By the way the picture above is actually me running. Sadly I am not the size 10 blond but the slightly larger pink runner at the front with her tongue sticking out!! Another piece of advice often given is that one ought to eat from a smaller plate. I tried this and ended up having exactly the same portion balanced precariously in a vertical mound. Needless to say it didn’t work. Then there is the problem of having a social life, and this is a biggy. Things in life that make me happy are in no particular order; my family, eating out in a nice restaurant, going out to dinner at friends homes, meeting friends for drinks, summer BBQs, finding new fabulous cafes, cooking, running, reading, cake and prosecco. You get the picture …. food related activities genuinely make me happy. I am not that interested in going for a healthy walk as an alternative to food when I am peckish, as the lifestyle books would suggest, however I did try something different just last weekend. Instead of just heading straight to a restaurant for food and wine myself and some girls headed to a climbing wall first ……… and then headed to the pub for food and a few bottles of prosecco to celebrate our achievements. My climbing wall chums are very naturally slim and just a bit more agile than me, so instead of feeling very healthy and fabulous I felt like a bit of a heifer and images of Bridget Jones’s arse coming down the fire pole in the first movie flashed into my head each time I slid down the rope. All in all it did not do much for my self-confidence – straight to the pub next time. Now I do not have much weight to lose and some friends I know think I am a bampot and look fine. I am a bampot and I do generally look fine but every six months there is more weight on creeping on which does not seem to come off. As this rate it will not be too long before they do not think I am a bampot and do not really look all that fine. Will being slim make me happy …….. the real answer is of course probably not but it will save me a heck of a lot of money as I am in danger of having to buy a whole new summer wardrobe. If you assume from my rant that I am not on a pesky diet, you would be wrong. Of course I bloody am. It’s not too bad really, It is Weight Watchers no count which is good as I am rubbish at maths and there is just a great big list of foods from which I can eat as much as I want. Technically speaking you are meant to eat until you are satisfied – I go a bit beyond that. For nice treats such as Prosecco and Mississippi Mud Pie I have special points which I do have to count. Some smug dieters claim that they NEVER eat their extra treat points which makes them bonkers. I not only eat every point I have but I also earn extra by exercising like a loon. Weight Watchers don’t necessarily advise this as a sensible approach but sod that – it’s the only thing keeping me going. So after all that I am losing a few pounds, moving lots and still managing to be just a little bit greedy and that will do for now. Lots of days out to navigate over the coming weeks and I promise to gather some real foodie material to pass on to you soon. It was my birthday in November and we were having a very very rare night out alone in St Andrews to celebrate. I had wanted to go to Little Italy (my favourite Italian) however B had not organised it in time and they were fully booked, as was every single other St Andrews restaurant I wanted to eat in. This my friends is why I was grumpy and having been the one to finally find room at the inn as it were was why HE was sounding smug. But I had never heard of the Playfairs Restaurant in St Andrews and I knew everywhere decent to eat …….. didn’t I? And so it was that we found ourselves with a few hours of precious freedom in St Andrews. Eating out is no good without an aperitif and so we headed to the hottest drinks venue in town – the Adamson Bar. Not content with having a fantastic restaurant (though I lament the day that they lost chef Michael Smith) they decided to open a bar next door, and what a venue it is. The design is simple and elegant and the bar is backed by an impressively huge mirrored wall whose shelves are adorned with beautiful bottles of mysterious concoctions. At times the bar resembles the lab of a mad scientist with dry ice potions and infusions being prepared by the skilled bar staff. Perched on bar-stools we had front row seats to the theatre of cocktail making Heston style. We were a little less adventurous – a simple prosecco to kick of the evening for me and for B (who was now mostly forgiven) an Argentinian Malbec. The Playfairs, it transpires, has been in St Andrews for a very long time and sits nestled under the Ardgowan Hotel. The restaurant is a family business which was relaunched in 2012 when son Duncan left his position at the prestigious Gleneagles to rejoin the family as Head Chef. Since then the restaurant has gone from strength to strength, serving up innovative Scottish dishes. The Playfairs has a vision – to be one of the few restaurants around who make everything in-house from bread and pickles to their balsamic onions which take months to make. Add to this their passion for local produce and seasonality – and you have a winning recipe for success right there. So perhaps I don’t know every good restaurant in St Andrews (that hurt!) but the proof is in the proverbial pudding, as it were. The Playfairs Restaurant is relatively small but oh so warm and inviting. There is lots of wood and exposed stone with natural grey brown tones used throughout. It has an absolutely lovely vibe. A moment here to mention the staff – magnificent! Our bearded ‘ever so slightly hipster’ waiter was fantastic. He had a great knowledge of the menu and the wine list and was not shy of recommending dishes or combinations. He had a great demeanour – chatty and fun. It does make a difference to your dining experience I find. Nothing worse than an ill informed surly waiter. The menu is pretty extensive with lots of fresh seafood and a lovely grill menu. I started with Chargrilled Shetland scallops cooked on a rosemary skewer with a crab fishcake and spiced tomato jam Brian decided to go with Shetland Mussels Marinière with white wine, cream, garlic and garden herbs. First off …. everything was beautifully presented and my shady candlelit pictures do not do this justice. I have a love hate relationship with crab. I want to really love it but often I find it a bit overwhelming. This little crab cake did not intimidate me at all, in fact it tasted rather delicate. The large scallops nestled on top were cooked to perfection – plump and juicy with a nice charring on the outside. It was a perfectly rounded dish. The success of mussels is based on the actual quality of the shell fish. These particular wee blighters were fat and tender and there were not too many closed shells to pick out. My favourite part of mussels is often dipping heavily buttered bread into the sauce. Brian kindly let me indulge (to a point) and I can confirm that it was divine. Sticking very much with a Scottish theme Brian decided to order Stovies, Playfair style to follow on from his mussels Slow cooked Black Isle beef short-rib stovies, bacon and tomato sauce and Playfair’s oatcakes. Unusually I veered towards the grill for my main course, opting for a Hebridean salmon fillet. Our wonderful waiter suggested that a bearnaise sauce and roast vegetables would be the best accompaniment and who was I to argue. After what seemed like rather a lot of wine I was more than happy to make no decisions. Brian’s Stovies looked and tasted splendid but it was agreed that the majesty of my slightly blackened salmon married with perfectly cooked veg and thee most perfect sauce trumped everything! It was really such a simple dish but as we all know simple food is hard to perfect as there is really nowhere to hide. Every part of this meal was cooked and flavoured to perfection and shone through both individually as well as working beautifully together. I fell in love with the Playfairs right there and then. As always we managed to fit in dessert. Moderation is a life long lesson for me and I am not a terribly good student. The sight of Clootie Dumpling on the menu transported me back to my granny’s wee house in Pittenweem, watching her pour the delicious spiced mixture into the clean cloot to cook. Lovely as a pudding and supreme fried up for breakfast the next morning. It was a no brainer – clootie dumpling it was. Brian opted for the truly crazy sounding option of Irn Bru crème brûlée with rhubarb sorbet, fresh fruit and ginger wine syrup – wowzer. Well as it goes the dumpling with clotted cream nearly ruined me – it was quite delicious but a tad on the large side. A heavy old pudding to end a huge meal – I did my best but I was coping none to well by time I conceded defeat. B on the other hand thoroughly enjoyed his concoction which was at least relatively light – interesting and quirky flavours working really well together. I hobbled out of the Playfairs in search of the best digestif that I could find. We headed back to the lab/bar at The Adamson where I was informed that a Fernet Branca would sort me out. It tasted a touch on the medicinal side but it did the trick. Would highly recommend if you have overindulged on rich food as I tend to do. For the uninitiated – Fernet Branca is an Italian type of amaro , a bitter, aromatic spirit. Fernet is made from a number of herbs and spices which vary according to the brand, but usually include myrrh, rhubarb, chamomile, cardamon, aloe, and especially saffrom, with a base of grape distilled spirits, and colored with caramel. What a night, what a restaurant, what a bar. One thing is for sure … I did not know all of the good places to eat in St Andrews and who knows where else I have missed. I doubt there is anywhere hiding that is as good as the Playfairs…… but it might be fun finding out. I was not living it up in Germany this October, partaking of large steins of beer as the title of the blog might suggest. October however was a bit of a food fest for the Grumbling Tummy collective. Mind you I am not sure which month is not a food fest for us! The first week of October found us perched on cliffs in a rather fabulous caravan just outside Filey on the Yorkshire coast. It was a holiday of tromping along windswept beaches and revisiting sentimental spots such as Whitby and Robin Hoods Bay. Ah that sounds romantic! It was also a holiday of swimming pools, penny arcades, water zorbing and of course EATING far too much! Whitby is one of my favourite destinations of all time for a winter break and the first place we make a bee line for on arrival is a very small restaurant near the harbour called Humble Pie. Humble pie as the name would suggest sells pies and the odd plate of sausage and mash. That is pretty much yer lot – but oh what pies they sell. From your traditional steak and kidney & mince and onion through to lamb and mint, homity and feta and roast vegetable. Pies here are served as they ought to be – with mash, gravy and a choice of beans or mushy peas and the correct way to accompany this meal is with a steaming hot mug of Yorkshire tea. It is really the best start to an autumnal break. I opted for a mince and onion pie with and gravy and as always it was splendid. They don’t have much choice but it is all about perfecting the e pies and they are damned good at what they do. Humble Pie is brim full of nostalgia from a bygone era, a theme embraced by another Whitby eatery. The Blitz cafe is a 1940s war time themed cafe complete with Glen Miller drifting from an old Wurlitzer juke box and interesting interior decor which includes sandbags piled up the walls. For a concept cafe the food was surprisingly good as often such places are all style and no substance. Aside from having a bit of a random tapas menu, the theme of the menu is firmly set in WW2. There are goodies such as bread and dripping, the battle ground ration board (ham, cheese, bread, apple and pickles) and ration bags for mini evacuees which included sandwiches, fruit, cake and juice. I plumped for the Welsh Rarebit which is something you don’t see very much these days and it was absolutely delicious. Huge hunks of bread with bubbling hot melted spiced cheese. Not sure what they used for flavouring – mustard for sure, Henderson’s relish perhaps. What I do know is that this tasty dish was more than enough to put a smile on my face and provide the fuel needed to get me up the 99 steps to Whitby Abbey. Back on home ground for a much posher affair with the Prosecco Lunch Club. We are 4 pals who meet once every two months for a spot of lunch and fizz. There are rules too …… oh yes there are! So shared interest of food and fizz and a rule and we have us a club. This month we went to a little restaurant in Edinburgh’s Broughton Street called Seasons. I was led to believe that this was an unconventional eatery in that we would be given a list of seasonal ingredients to choose from and then a dish would be created – voila! A bit like Can’t Cook Won’t Cook for toffs. This was not the case for lunches sadly, so instead we chose from a rather lovely small lunch menu which came at a very reasonable price. Before I launch into the food, a little bit about the restaurant itself. It very intimate with a warm Nordic vibe – incredibly tasteful and simple really. Strangely for a Saturday afternoon in the heart of our capital – there was nobody else dining there. I can only assume that it attracts food loving couples who flock there of an evening to gaze at each other by candlelight. Either that or it is actually a restaurant for vampires – take your pick. It is certainly is not the food that was keeping the crowds at bay – for that was very very good indeed. We all chose smoked duck to start (In house smoked duck – mushroom & black truffle salsa, blackcurrant, lamb sorrel, Scottish brambles) and there were squeals of delight (OK that was just from me) when the duck arrived underneath a little cloche filled with smoke. It was all very theatrical and Hestonesque when the cloche was removed and the smoke escaped. We would have applauded if we have not been coughing in unison. To be honest it was impressive and that duck was moist and tender to a fault. The intense smokey flavouring was perfectly balanced by the fruit. All in all a great start. I then moved onto venison ravioli. It was actually a single whopping ravioli filled with venison and it was truly delicious. Tender and seasoned to perfection, it was served with a delightful sauce which was only a tad on the foamy side. I generally loathe foam on a menu. I feel (and please excuse my lack of finesse on this matter) that is looks like spit on my food. Best to be an honest blogger! However this main course merely hinted at foam without offending me and it tasted wonderful. My dessert as you can see resembled a deconstructed cheesecake affair full of chocolate soil and dehydrated shards of raspberry. We were a few wines in at this point therefore the finer points of this course dessert me – boom boom! Safe to say it tasted heavenly. With the beautifully presented and unfaltering flavoursome food, the attentive service and pleasant surroundings I would find it hard to find fault with Seasons. It is a cut above the rest of the non-Michelin brigade but had the feel of a restaurant striving for that status. The only problem for a greedy blogger for me was the portion sizes. Modest portions have me running for a burger on the way home but as I say – I am just rather on the greedy side. I decided that this summer I was going to grow vegetables for the first time ever and embarked on project tomato. Easy the Dobbies lady said ….. cannot fail she said. And you know what? She was right – in a way. So I planted the little seeds and before long they sprouted and I was like a proud parent cooing and bragging to everybody who would listen. There were 30 plants in total and I loved them all, chatting to them and feeding them until they were big enough for a second round of re-potting. Bursting with pride I decided it was time to share my good fortune. I kept 10 plants for myself and split the rest between two friends. My 10 plants grew and grew but alas no flowers appeared. After an aborted attempt at sheltering them in a temporary greenhouse which fell foul of a gale force wind, I was left with 5 plants and still no flowers. Finally one little solitary flower on one plant appeared. I was beyond excited, my faith had been restored. In the mean time the other 20 plants which had been adopted, were growing like bloody triffids and drooping with the weight of all of the beautiful tomatoes sprouting like wildfire. Bitter – hell yes! So here it is, my bumper crop. One beautiful round red cherry tomato, eaten in a tuna salad on a Friday lunchtime. It was wonderful. I am still finding it hard to come to terms with the other treacherous 20 plants but I am getting there. Counselling helps! Do you ever look at pinterest? Does this not remind you of a classic pinterest fail? It is actually from the ASDA magazine and these beauties in case you didn’t know are Sausage Mummies. Embracing Halloween I decided that I would attempt some mummy, daughter cooking. As always with mummy/daughter pursuits there is a huge gulf between how I imagine the task unfolding and how it actually unfolds. After 6 years I still have not got to grips with the fact that the romantic magazine notion of crafting/cooking with your kids is a big fat lie. You know the one – where they are smiling and engaged, with perhaps a cute splodge of icing on their nose which mum wipes whilst laughing gaily. Here is how it goes in our house. Me: Hey look at these, aren’t they fab? Shall we make them together N: yeah! So I bugger about with the pastry and the sausages on my own and then cook them but the mayonnaise makes them look like depressed mummies – which is ironic! Anyway I suppose I ought to be grateful that she ate them. Harumph! Mireille Guiliano famously wrote a book some years ago entitled ‘French Women Don’t Get Fat’. I’ve read the book and think that she may have forgotten to mention the magical willpower of the average French woman. I am not big on willpower and I was well on the way getting very tubby following two weeks eating in France. It is the only explanation I can think of! Our French adventure was in the Calvados region of France in beautiful Normandy. B was ecstatic as to him it was all about trundling round WW2 museums and seeing lots of tanks and gunning placements, whereas for me it was all about mucking around on stunning beaches and eating lots and lots of food. France has often been hailed as one of the great food centres of Europe, however until now I have been seriously underwhelmed. In Paris we sat through several bad meals and indeed my only fond food memory from the French capital was a rather fine Croque Monsieur served without fuss in a simple café. In Carcassonne the food was no doubt wonderful, but as I’m not a fan of cassoulet I was rather out on a foodie limb in that particular region. Normandy was a game changer as far as my ratings of French cuisine goes. All along the spectacular coast there are a string of beautiful seaside towns, unsullied by arcades and the‘taps aff’ brigade. The beaches are stunning and all about wholesome seaside fun – think sandcastles, kite flying, swimming, candy floss and boules. The pretty resorts most importantly are also littered with great places to eat …. and eat we did. As we were just along the coast from the Brittany, home of crepes, we did expect them to be rather on the good side and we were not disappointed. Some notes about this very French speciality – first off a crepe has a sweet filling, those with savoury fillings are called galettes. I ate both in abundance. Second interesting fact is that most of the galettes in Normandy are made with buckwheat flour, which is gluten free. 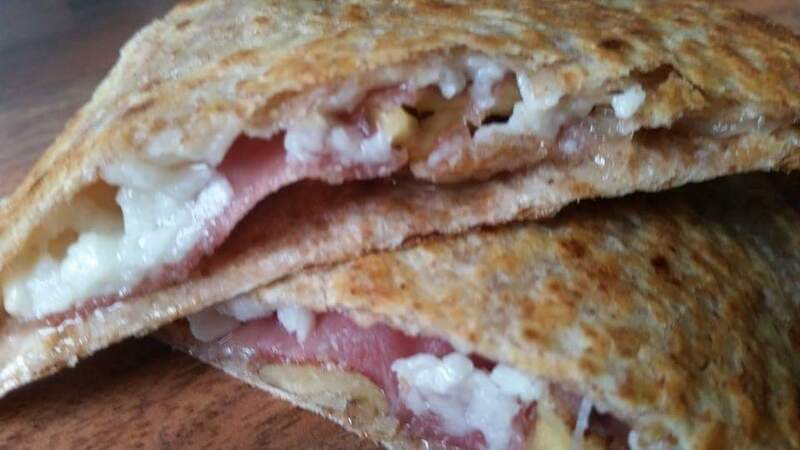 This allowed me to ignore the cream and cheese involved in some of the fillings and focus on the fact that it sounded healthy – it ought to be noted that most of my crepes included cream and indeed cheese in some form or fashion. There were many, many fillings to choose from but my BFF crepe was filled with crème fraiche, potatoes, lardons, onions and mushrooms, and I am betting a hefty daud of garlic too. I ate this particular offering all over Normandy – from the delightful Le Crabbe Vert in St Aubin sur Mer all the way to the best example in a café in Bayeux. The wee grumbling tum is notoriously hideous at eating on holiday, normally zoning in on one food stuff she will deign to eat for the entire trip. This holiday we lucked out with her decision to eat two types of food, once of which was Crepe with Nutella. She ate this daily and as she has a little tiny tummy, mummy often had to help out – shucks! The best crepe I sampled was in the lovely Crab Vert restaurant in St Aubin Sur Mer. topped with beautiful freshly stewed apples and calvados. We are not talking a hint of calvados in this after dinner treat – it was full on blow your head off calvados – and it was rather splendid. When in Normandy! With around 600 cidre producers in this region and hand painted road signs directing you to where you can buy and taste every few miles, there is little doubt that this is Normandy’s national drink. This is a part of the Norman culture that I embraced with open mouth! I like cidre anyway but the Normandy version seemed so much better than the brands available in Scotland. Not overly fizzy yet not flat like scrumpy – somewhere pleasingly in-between. Or maybe it was just the sunshine! Coming in three varieties – dry, sweet and corked (twice fermented with more sparkle) – cidre is not traditionally served in a glass but in a bowl. A cidre bowl is rather like a large round coffee mug or a small soup bowl. I am not sure if this enhances the taste but it sure is fun. As with most local drinks when travelling, cidre is pretty cheap to buy and we were well stocked up for the whole trip ……. and beyond. We were however a little over-enthusiastic on our return and have run dry, so if you are planning a trip to Normandy …… could you? Normandy is a haven for lovers of Moules et Frites. I have never in my life eaten as many mussels. I pretty much stuck to the same version of this classic every time I ordered– Moules Normandie. This is a variation of the classic mussels and white wine, instead the mussels are served with cream, onions and cidre. Everywhere I tasted this the mussels were beautifully plump, amazingly fresh and the sauce was to die for. Perfectly crispy frites were reserved for dipping in the creamy sauce, it really is the best of all foods. There is a garlic version of this dish which I attempted one evening and trust me when the French feel the need to include the word garlic in the description of a meal it is Def Con One on the garlic breath alert. I spent the rest of the night trying hard NOT to speak to anybody and there was definitely no snogging for me. If you like mussels (and I do) then you will never ever be disappointed in a Normandy restaurant. The discovery of a particular pink patisserie in the heart of the beautiful city of Bayeaux was when it all went wrong for me. It was the beginning of the end of any pretence that I was trying to be healthy. This particular patisserie was a sight to behold – beautifully decorated in bright fuchsia candy stripes, pink regency style chairs, elaborate plump feather cushions and the largest patisserie counter I have ever seen. We were dumbfounded and incapable of any decision making. The poor waitress had the patience of a saint as we asked a 6 year old to choose from about 100 sweet treats (eidgets!). It all became rather stressful at one point. Eventually I settled on an almond cake which was divine. Sweet perfection. The game was now a bogey as far as a cakeless trip was concerned and this was the first on many sweet downfalls …….. the first is always the best! The official cheese of Normandy – Camembert. If you are going to have an official cheese then what a variety to have. Camembert is served up in so many different ways in Normandy – from crepe fillings and moules camembert to salads, whole baked cheeses and pizza toppings! My all time favourite Camembert creation was in a restaurant in the beautiful town of Honfleur. We sat by the harbour in the baking sun drinking ice cold cidre and eating a gorgeous crisp fresh salad topped with pieces of Camembert lovingly wrapped in filo pastry and deep fried until the filo was warm and crisp and the cheese was molten. The salad was topped with salty warm bacon. The best use of Camembert ever! It is impossible to ‘whizz’ around a French supermarket or ‘pop in quickly’. French supermarkets are there to be savoured and one must take ones time drinking in all the delicious food there is on offer. We were relatively near a Hyper U and spent more time than is normal wandering around the ailes. The cheeses, the array of cold cuts, the riot of colour in fresh produce, the wine, the cidre. In an ideal world I would have dumped the husband and the kid for an hour or two, and spend a few hours procuring items to take home with me in a spare suitcase sized cooler. A girl can dream can’t she. Never underestimate the beauty of the simple croque monsieur. I have had several and they never disappoint. Okay I do admit that this is really a glorified cheese and ham toastie but glorified it is none the less. The cheese is a fabulous gruyere, the ham is generally of superb quality, the bread is sweet and fluffy and it is fried up with a bubbling bechemal on the top. I find it hard to knock the humble croque monsieur. In Arromanches I had the most wonderful Tarte Tatin I have ever tasted (not that I have tasted that many). The pastry was so light and airy and the apples were ludicrously fresh and sweet. All of that plus caramel and a dusting of icing sugar – divine. In Falais, home to William the Conqueror I ate the most divine cheese cake of my life . The key was in the base which seemed to be made from a buttery salted caramel biscuit. It was simultaneously crunchy, moist, sweet and salty. This was a show stopper. I could of course go on …… but I am sure you have read enough so I will leave things there. Suffice say that the food in Normandy possibly surpassed Italy and that is saying something. We are returning to France next year – this time to Brittany – watch this space…. Categories: MUSINGS, Uncategorized | Permalink. 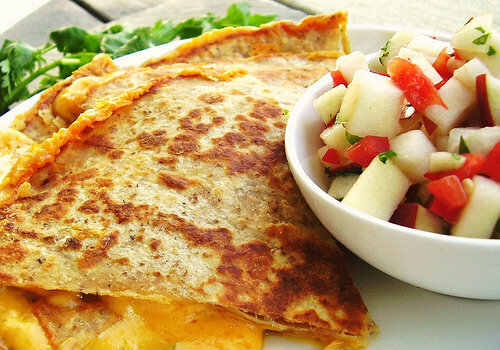 In the last few months the humble quesadilla has become my absolute go to food for breakfast, lunch, dinner and snacks. Smashing the boundary of what can actually be termed a quesadilla I am constantly finding more and more interesting ways to serve them up. The obsession really ramped up a gear when B trotted off to Argentina for a week leaving me in sole charge of the six year old (gulp). We did grand me and the nipper but by the time I had put her down at night and tidied up a bit there was little time left to whip up something tasty for dinner, even pasta seemed like too much trouble. 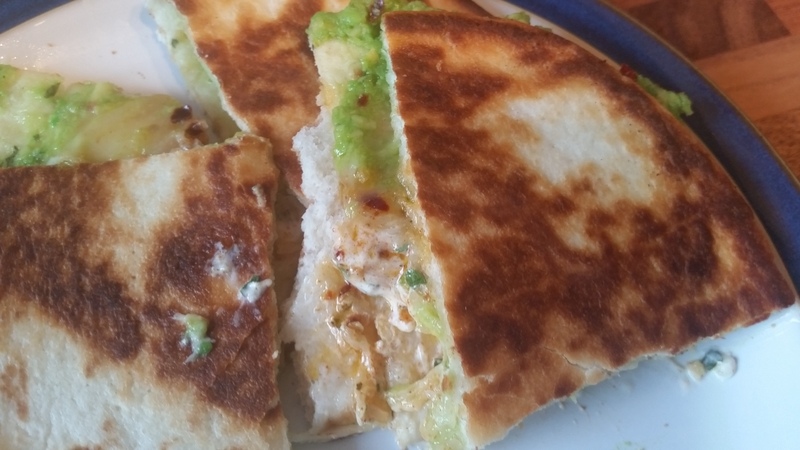 Enter the quesadilla – a bag of tortilla wraps and a seemingly inexhaustible range of fillings saved the day. Add to that a chilled bottle of San Miguel and I had a meal fit for a queen. Before long my notoriously picky daughter got in on the fried sarnie act. Once you find something this one will eat – you stick with it and with it and with it. I don’t really need to tell anybody how to make a quesadilla. You get two tortilla wraps and fill them like a sarnie then fry them in some oil so that the filling is nice and toastie and the tortilla is nice and crispy craspy – simples! Cook some finely chopped red onion, garlic and chopped chillies in a little olive oil. Once softened add cumin, lime juice and a can of kidney beans. Smash the lot up with a fork or a mini-masher (do you get such a thing – if not then you should). Use this as your filling and top with cheese. Serve with lashings of soured cream. Left over chilli with grated cheese and thinly sliced avocado. Go easy on the meat mixture or you will have to eat it with a knife and fork. Can get a bit on the sloppy side. A personal favourite – a few slices of prosciutto topped with a hard or semi hard goat’s cheese. Crumble some walnuts over the top and finish with a drizzle of honey before serving. I realise the little one’s choices are lacking in worthy ingredients like kale or even the odd carrot chucked in – but then they wouldn’t be her favourites would they? Besides when this kids eats anything with gusto we go with it. Nice to be back after a rather long Christmas break. Now I am off to fry up a quesadilla. Without a shadow of a doubt THE best mincemeat pies on the market today are ALDI’s Specially Selected Luxury Mince Pies. At £2.99 for six they are slightly more expensive than your average ALDI offering but by god they are worth every penny. I am not a lone voice either, the Independent judged them third best in their list of 15 great mince pies for 2015. For me what makes them super special is that they are not huge yet very deep filled, topped with almonds and somewhere in there, there is a smattering of marzipan. How can you resist. Well I haven’t which brings me on to the next thing on my list of shout outs for December. Well if one is stuffing one’s face with ALDI mince pies and squirty cream most nights of the week then it is wise to at least attempt to be healthy at the start of the day. My husband bought me a Breville Active Smoothie Maker from my birthday in November and it is one of the best things I have ever been given. It is simply the most quick, simple and clean ways to make a smoothie. A blueberry and banana combo are top of the smoothie pops at the moment but I can also recommend going for banana, mango and coconut milk for a truly tropical taste. If you say you don’t have time for breakfast then you must buy one of these bad boys. It is really a case of ‘blend and go’ with stylish little bottles which are great to shove in your hand bag/man bag to drink on the move. In November I was invited to a My Secret Kitchen event by my friend Vickie, who despite running around after three small kids, one big kid and running her own training business has somehow managed to squeeze another venture into the mix. As an agent for My Secret Kitchen she offers an extensive range of spice blends, oils, vinegars, tea blends and other yummylicious treats which are a delight to the senses. I love cooking but I am also just a little bit lazy and therefore spice blends are ideal for me. Something that can transform Monday’s mince into a mexican treat bursting with flavour in the blink of an eye gets a huge thumbs up. I would have liked to order pretty much everything displayed on the table at the party, however products as lovely as this do not come with a bargain price tag …….. but as my granny use to say, you get what you pay for. She possibly never said that but I am rolling with it. In the end I ordered a bottle of Lime Oil – used liberally in a range of couscous inventions thus far. Fajita spice blend – used in a chilli, a smashed bean and lime tortilla and just sprinkled over a fried cheese flat bread sarnie. Finally I purchased a Shawarma blend which I have used in little lamb patties. I also signed up to a rather exciting option called Flavour Stacks. Each month I will receive four mini pots of MSK products each with a recipe card. Thrilled by the idea of NEVER knowing what is coming my way. WOO HOO! Check me out frequenting Michelin Star restaurants this month. I actually thought that I was off out for a pub lunch and shoved my jeans on. “Is that what you are really wearing” chimed in my rather anxious looking other half. Though I thought he was very rude I changed into a skirt anyway. Turns out he had only booked us into Martin Wishart’s in the Port of Leith for a lovely spot of fine dining! He is racking up the brownie points at the moment, that husband of mine. So is it worth the hype. Well in a word YES. All of the dishes look heavenly as you might imagine and each meal has an intensity that you only find in a handful of restaurants across the country. You can also expect an explosion of flavour with every single mouthful at Martin Wisharts. The food was a joy! We were presented with a lovely selection of amuse bouche prior to our main meal, and for me the stand out ‘bouche’ was the Beetroot Macaroon with Horseradish Cream. One word – clever and anther word how? Intense flavour and lovely textures with a delightful horseradish hit. The Artichoke Veloute with the surprise layer of chestnut puree on the bottom was an amazing starter made even better with the addition of langoustines. I am not a fan of ‘foam’ in my meals in any shape form or fashion. I do understand that foam is rather a benchmark of molecular gastronomy, but really I do find it a pointless and rather distasteful food trend. HOWEVER I could overlook the addition of foam on my main dish of cod due to the fact that the fish was cooked to perfection and the flavours surrounding it were superb. A fantastic delicate dish. And to finish – a bitter dark chocolate tart with popcorn and salted caramel ice cream. Well what can I say. Stunning, absolutely stunning. I took no photographs or notes (hence the vagueness of this review). It just didn’t seem the right setting to start clicking away. I regretted my decision towards the end of the meal when I spotted a woman with a camera roughly the size of her own head feverishly clicking away. The lunch menu is only £28 which is amazing value for a restaurant of this standing. One or two wines however and you will soon see your bill rack up. So go along and have some lunch and water – it is a fantastic experience. So off I go into the holidays where I shall no doubt gain several pounds eating multiple mince pies, chocolates, prosecco and anything else I can lay my paws on with the cry of “ach well it’s Christmas” seeing me through to the New Year , at which point I shall finally stand of the scales. After rocking and keening for a while I shall set upon a new diet and start the process all over again. Hurrah for Chirstmas! !